Don passed away suddenly while on vacation at his daughter’s home on Salt Spring Island, BC, April 3, 2018. 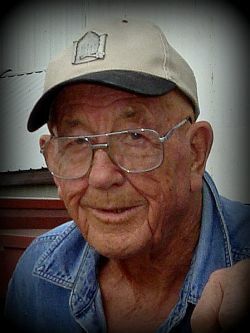 He was predeceased by his parents, siblings and wife of 55 years, Gilda (nee Simpson). Don is survived by his daughters, Donalda Fredeen (Fred), Dianna McEwan (David Telfer), and his sons Les McEwan (Barb) and Grant. He is also survived by six grandchildren, Norman McEwan (Lindsey), Kyle McEwan (Jose), Melissa Derksen (Harley), David Telfer, Naomi Fredeen, and Ashia Fredeen. His six great grandchildren are, Joe McEwan, Ava McEwan, Hunter Derksen, Hudson Derksen, Brianna McEwan and George McEwan. Don was born to parents Norman Roy McEwan and Mabel Winnifred McEwan (nee Wilson) on May 23, 1928 near Altamont Manitoba. He was the youngest of 6 siblings, Edith, Wes, Bob, Gordon and Grace. He worked briefly in Ontario logging timber and took over the family farm at Altamont in 1950. Gilda became his wife in 1952 and together they raised their four children. He was still actively farming with his son, Les up until his death. Don was an avid hunter, fisherman and loved being in the great outdoors. His latest outing was just a week before he passed away, salmon fishing with his daughter Donalda. Over the years he went on many hunting trips with his partners Murray Stockford, Jim Wilson, Ron Lowry and Alex Grenier. As a couple, Don and Gilda loved to travel and visited many destinations in Canada, the United States, Mexico and Cuba. Don was also a long standing member of the Grand Lodge, served on the Manitoba Hog Marketing Board for 25 years as well as participating as a director with the Morden Credit Union and Keystone Agricultural Producers. One of his recent accomplishments was to publish a book of his memoirs with the assistance of Donna Fortier. He was a very social person that touched the lives of many, and will be sadly missed. A Celebration of Life service will be held at the Altamont Community Hall 2p.m., Saturday May 12, 2018. In lieu of flowers, donations may be made to the Altamont Community Hall, Box 47, Altamont Manitoba, R0G 0A0. Our sincere sympathy to Les and Barb and the rest of the family. Always an interesting person to visit with. Have enjoyed being a next door neighbour of sorts over recent years. Admired the wit and interest he showed - quest for knowledge - over the years. May you know peace and comfort in your memories. Donalda, Dianna, Les, Grant and families. My thoughts are with you. I have such fond memories of your dad, from childhood when we vi[censored]d and as an adult when I was visiting back in Altamont. He always had a story and a laugh to share. Donalda, I'm glad he was with you when he died, it would have been a comfort for him to be with family. My condolences to everyone.